This is a repost of a previous post. As new students are visiting the Prairie Martial Arts site I want them to get just a taste of our groups history. 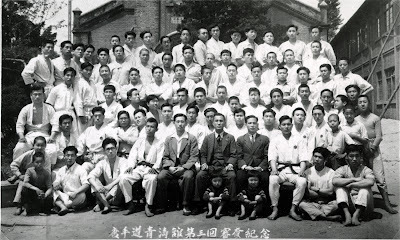 A while back two online friends helped me with the translation of some historic Chung Do Kwan photos. The first comments are from Tashigae... "OK, here we go. The first three characters, in case you haven't recognized them by yourself yet, are 'To' - 'te' - 'do' ('Tang' - 'shou' - 'dao' in Chinese), 'Chinese' - 'hand' - 'way', in other words Tode-do, the old name of karate-do. The three next characters are Chung Do kwan ('qing' 'tao' 'guan' in Chinese, 'guan' being 'kwoon' in Cantonese and 'kan' in Japanese, as in 'Shotokan', Bujinkan', etc.) and mean Green Wave school (in Chinese, 'guan' actually refers to a building with only one or two floors but a very large surface. Didn't know how to translate that, so I chose to translate contextually as 'school', since it's often used as a metonymy for a school or style in Japanese). The next three characters mean 'the [N]th time' ('di [N] hui' in Chinese, don't know how to pronounce them in Japanese). The next character is unknown to me (sorry), but the next one ('cha' in Chinese, Japanese pronounciation unknown) suggests me that the two together might mean 'examination' or something like that. The next one ('hui' in Chinese) means 'meeting', 'gathering'. The last two characters ('ji nian' in Chinese) mean 'keep record', 'keep memory' (I must confess I had to ask my beloved for this one ).To sum it up:'record of the [N]th (examination?) meeting at the Green Wave dojo' ([N] being 3, 5, 7, 2 in that order)".